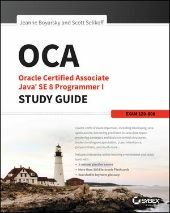 Hello everyone, on 26th of January 2016 I passed the OCA Java 8 exam with a score of 95%, which means that I managed to get 73 out of 77 questions right. This was the first certification I attempted so far and the preparation took me roughly 10 work days. I already had some (non-professional) experiences with Java, but the last time really worked with it was when Java 6 was new. a lot of self written example code. I read the chapters of the book in order and at the same time wrote sample code for every non-trivial behaviour the book mentioned, but also for corner cases I was wondering about. I also tried to understand behaviour I encountered which was not on the exam, see for instance this thread. After every chapter I solved the end-of-chapter questions as if they were an exam (i.e. without checking any sources) and on average got about 85% right, with a nice 100% in chapter 2 and a shameful 50% in chapter 6 (I let the questions really confuse myself about checked and unchecked exceptions). After that I took the three online mock exams and got 80-90%. I found the actual exam easier that the questions in the book and mock exams, although the questions were very similar. The exam also contained some trick questions, but they seemed on average less tricky than the ones I learned with, but maybe that was just because I now know how to handle these questions. Congratulations! Excellent score. Keep up the good work. Jan Stückrath wrote: This was the first certification I attempted so far and the preparation took me roughly 10 work days. What do we need to understand with "10 work days"? Did you study for 10 working days (combined with a daily job)? Or did you study e.g. for 80 (or more) hours in total? Congrats on the high score! Glad our book could help! Thank you, but I will have to disappoint you, I am not that into beer. My current company is paying the exam for me and also giving me the time to study. So "10 working days" are 10 days of my daily job where I could concentrate on studying and testing, of course with occasional smaller disruptions. Scott Selikoff wrote: Congrats on the high score! Glad our book could help! Thank you, I found it very helpful. I really liked your occasional comments what topics and qestions will be or will not be in the exam. Jan Stückrath wrote: My current company is paying the exam for me and also giving me the time to study. So "10 working days" are 10 days of my daily job where I could concentrate on studying and testing, of course with occasional smaller disruptions. I am really glad that I had the possibility to learn this way. My score would probably not be that good if I had only a few hours per day, and of course it would not have managed to do this within two weeks. Wrapper classes and enums in oca?